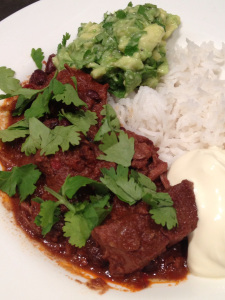 This is my all time favourite chilli dish, it can be made ahead of time at each stage, freezes well and feeds a crowd! It is also surprisingly quick to make up before it goes in the oven for a long slow cook. I don’t brown the meat and instead leave the meat in the onion, garlic and spices overnight before throwing in the tomatoes and water, bringing it up to the boil and popping it in the oven. I buy jarred peeled capsicums, lazy I know, I just check for seeds and then dice them, much easier than peeling fresh and saves time too! I like my chilli quite thick so I often cook it uncovered for 90mins for the final stage but 60mins gives you a bit more liquid if that’s how you like it.